This article is about the ship SS Mayaguez itself. For the 1975 actions involving this ship and the aftermath, see Mayaguez incident. The Mayaguez was first launched in April 1944 as SS White Falcon, a U.S. Maritime Commission C2-S-AJ1 freighter built by North Carolina Shipbuilding Company of Wilmington, North Carolina. After World War II, the ship was sold to Grace Line and renamed the SS Santa Eliana. Seeking to containerize its coffee bean traffic from Venezuela, in 1960 Grace had the Santa Eliana and her sister ship Santa Leonor lengthened and widened by the Maryland Shipbuilding and Drydock Company and converted into the first U.S.-flagged, all-container ships devoted to foreign trade, with a capacity of 382 containers below-deck plus 94 on-deck. 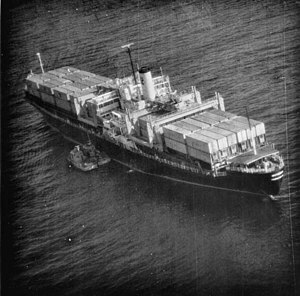 With Grace Line's plans repeatedly frustrated by longshoremen opposition in both Venezuela and New York, the ship was sold in 1964 to the American container line Sea-Land Service and she was renamed SS Sea, and then SS Mayaguez (named after the city of Mayagüez on the west coast of Puerto Rico) in 1965. Her sister ship was renamed Land and then Ponce (after the city of Ponce on the south coast of Puerto Rico). In 1967 Sea-Land began regular container service under contract to the Military Sea Transportation Service (MSTS) in support of American forces in Southeast Asia, with the Mayaguez being one of many Sea-Land ships employed. In 1975 the Mayaguez was sailing a regular route: Hong Kong – Sattahip, Thailand – Singapore. On 7 May 1975, about a week after the fall of Saigon, Mayaguez left Hong Kong on what was said to be a routine voyage. Duly retrieved from Khmer Rouge forces, the Mayaguez was taken out of service and eventually scrapped in 1979. ^ "Capture and Release of the SS Mayaguez by Khmer Rouge forces in May 1975". American Merchant Marine at War. This page was last edited on 24 August 2018, at 16:59 (UTC).